There's an awful lot to like here. The documentary begins with Jack having his beard and hair bleached, a process that turned out being pretty unpleasant (well, unpleasant for him - it was hilarious to watch). He then took a two-day course in becoming Santa Claus and headed to the East Coast for a series of gigs in Massachusetts and New York. Jack's story was fun, and he certainly offered a good point-of-view. He approached the whole thing sincerely but kept a sense of humor and never seemed to lose his perspective. But the real stars were the peripheral characters: the eccentric woman running the Santa school, the stereotypical Bostonian who hired Jack for a parade, the veteran Santas interviewed, and - of course - the kids. The historical tangents were decent overall. I was glad to hear the Coke archivist discredit the myth that his company's ad campaign invented the iconic Santa suit, and there was some good info about Black Peter. I'd have preferred a little less time be given to the head of the St. Nicholas Center, whose analysis seemed questionable to me. I'd also have liked a little time spent on other sources that contributed to the modern Santa. It seems like things like this give credit to either Saint Nicholas or pagan sources, but never both. I'm not sure why. But those trivial details had little impact on the overall documentary, which was simultaneously witty and sweet. 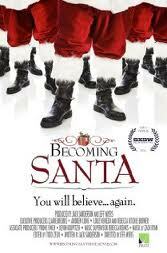 This was one of the best Christmas movies I've seen in a while, and I highly recommend you check it out.